The truth was: I had vacation time slotted for late January, intended for a trip to Austin, Texas. That fell through. With this free time undefined, amidst a government shut down that made airports unreliable, my natural inclination was to just stay home and sink into the earth. The idea of just turning off for a week was appealing. But I also don’t like myself when I indulge in that. It’s not the way I envision myself to be, though I understand and recognize it. 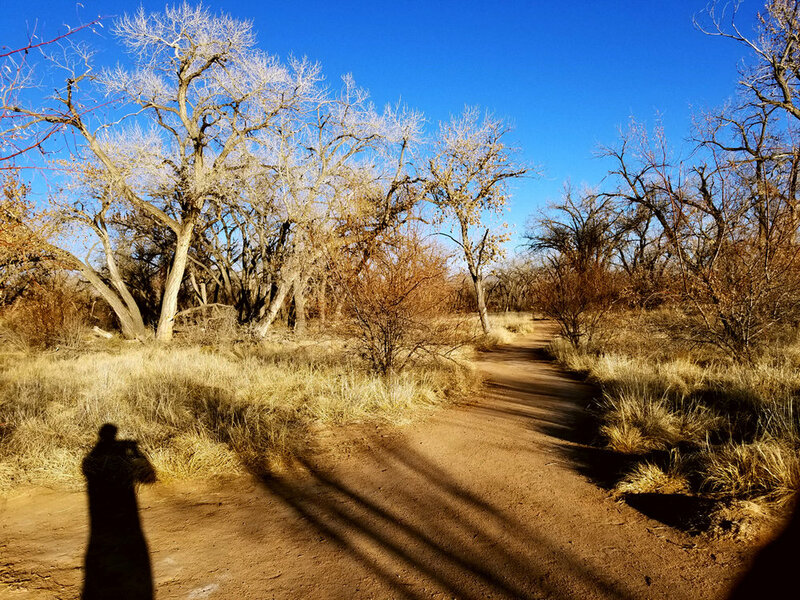 In the week before my vacation, I decided on New Mexico simply because it was convenient. I could literally take a train from my apartment to Downtown Albuquerque. An AmTrak also went to Portland, but I’d been to the Pacific Northwest frequently. It felt important to do something new and alone. Mostly, I wanted to live a different life for a week. One of the underrated joys of travel is transposing your small, simple routine into a new environment. The purest pleasure I have on the road is waking up in a strange bed and walking through New York or Seattle to have coffee and read. It’s an alien sensation that makes you feel awake, uncentered, and present in time. You break from the haze of daily life and remember where you are. If that’s all I accomplished, that would be enough. The train ride was 16 hours long. What’s great about the train is that it’s low stress and full of freedom of mobility. I walked around the cars, ate a pre-packaged donut in the observation car, and spent a lot of time looking out into the blind, black night. In the late morning, we pulled in to a no-frills concrete station. At first I thought it was the only building for a mile. A single foldable table had native-made crafts for sale. Immediately I was hit by the sense of space, and then by the brown-and-beige tint of the buildings. I found a bathroom, brushed my teeth, and started walking to a car rental place. I was staying in a room, in an empty house, with a plaque out front declaring it to be a historical site. The owner never physically checked in. Its abandoned appliances — a dried out wreathe on the table, a water pitcher left half-filled on the counter — came to take on a haunted air in my mind. The neighborhood was poorly lit and dead quiet, and once an old lady watched me intently from her porch while I parked my car and fumbled for the keys. In the great metropolises, they use the limitations of space and more to create sanctuaries to a particular community, or ethos, or auteurist dreams. Downtown Albuquerque’s places were unremarkable: a Brazilian barbecue place; a New York pizza place; a chicken wings place. All of them competent and designed with such broad, indistinct appeal that you could airdrop them into any airport or Las Vegas casino with no issue. There were also a lot of empty storefronts in what should be prime real estate. It all felt like a place that wanted to make something happen, but they just didn’t have enough people. On day two, I drank coffee at the local bourgeois coffee shop to read and write and then went to look at the Rio Grande. It was cold, but the sun was burning a line across my face. The forest surrounding it was dry and winter-dead, yet full of strange birds. Rivers are an unfamiliar concept to those of us in the California metropolis. We have the ocean, but its cultural meaning is entirely different. Our beaches are places of relaxation, or vacation, or beauty. The Rio Grande is more somber than that. When I saw the occasional person on a park bench watching the river, they did not seem to be the type that was “taking in the rays.” The act of watching a river is inherently an act of sadness. If you were watching the river, something weighed on you that an ocean would not relieve. While I was exploring New Mexico, Phoebe Bridgers & Conor Oberst released an album under the name Better Oblivion Community Center. I couldn’t have asked for a better companion on a solitary trip to a new, small place. I plugged my ears with their music and it gave my walks, the time in-between activities, purposeful. I tried to cap off the first day by taking in local art. I went to the cool district — every town has one — with the art store and found a lot of fun stuff, but nothing that was both affordable and spoke to my taste. I went to a random concert at a downtown bar and found a difficult, experimental keyboardist playing to a near empty floor. I was more excited about getting to the walk home and Better Oblivion. My next day was planned as a day in Santa Fe. It started off with lots of little blunders. My first stop was a hike around Tent Rocks, a famous and beloved rock formation. Upon arrival, I was greeted with a sign that said they were closed during the shut down. The guy at the information center, still working despite it all, said at best I could walk around a nearby reservoir, but I never found a path down. I decided to proceed to Santa Fe proper, to an immersive art funhouse of sorts called Meow Wolf. Turns out, it was closed that week for renovations. I took a picture of a giant robot sniffing a flower in their parking lot and kept going. Finally I made it to Downtown Santa Fe, which in other cities they may designate as “old town.” Outside of this small district, it was just like any town. It looked like Torrance with snow on the ground. But Downtown is a world apart; a walkable, historic place out of time. They preserved the town’s history with narrow, uneven cobblestone streets and pueblos arranged in the way you see them in old west movies. It’s extremely touristy, but it’s the ideal tourist attraction. Somehow its combination of affluence and history gave it the vibe of winter in New England combines with the Old West around the corner. In Albuquerque, I had to appreciate its banality and digest it as its own kind of charm. Mental judo to justify going to a big town of nothing special. 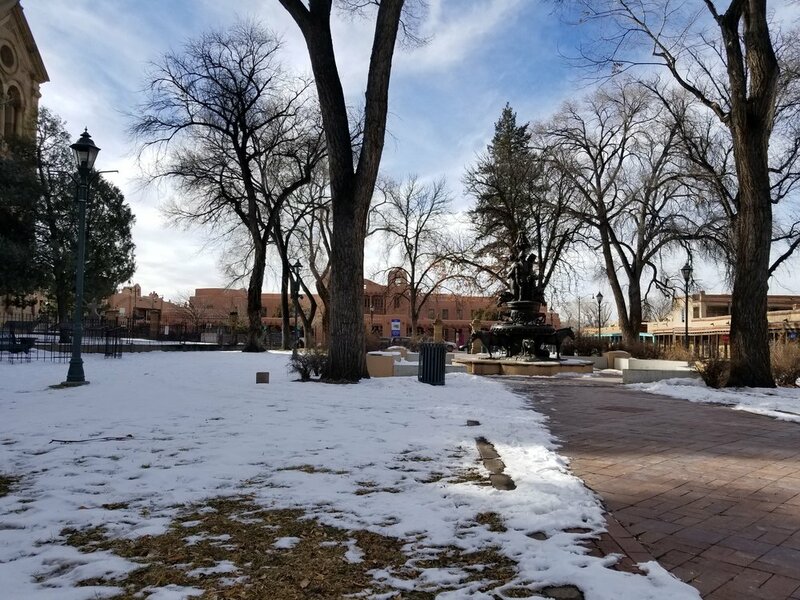 In Santa Fe, I could turn that off and just enjoy the pretty plaza. Whenever I travel to an American city, I try to buy a print from a local artist. Usually it helps embody my experience there more than a refrigerator magnet with my name on it. I looked at a lot of galleries in Santa Fe and came close to splurging on a piece. It was a series of colorful doodles by a Native American artist depicting horses, battles, and feathers — all drawn on top of real civil-war era documents. It was exorbitantly expensive, but I seriously considered where on my wall it could hang. My last day in New Mexico wasn’t much of a departure. I went back to my room in Albuquerque and slept in late. I walked to a nearby place to get one of the state’s famous breakfast burrito, which was chock full of potato and too spicy for my tastes. I took a trip to a nearby series of artificially stocked ponds, where a handful of people were doing catch-and-release fishing. I saw two Canadian Geese and took pictures of them; they let me get pretty close. As I drove away I passed another pond that was swarmed with hundreds of Canadian Geese, and a couple of kids standing among them. I debated pulling over for The Gram, but I had to drop off my car. I had coffee, read, and wrote. I climbed aboard my train home and played it all back again in my head. I’ll think of New Mexico as the place I absorbed Better Oblivion Community Center. I’ll think of it as my first experience of the American Southwest. I’ll think of it as another trip I took alone, a logical milestone to the many things I do alone these days, and how loud it gets when you’re just staring at a river.